Destiny 2 has launched Allegiance quest officially for its players during the past week. 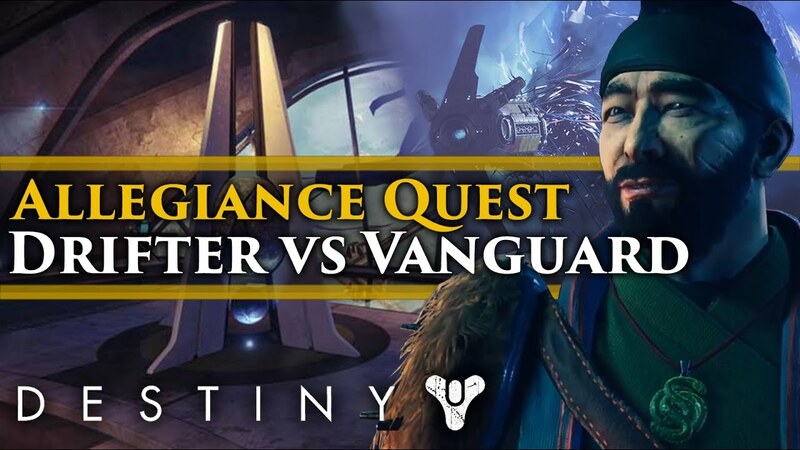 In this quest players will have the choice to choose one of the characters as their ally that include The Drifter and The Vanguard. You’ll have one of them as your ally. Coming missions in the game will depend upon you character choice as selecting The Drifter will give you unique missions and selecting The Vanguard as your ally will set you on a different path. Also, depending upon the quests, the reward will be different too. Another interesting thing that has been added in Destiny 2 is that it teases the players by showing that their choice may have consequences in the future in game. In this article we are going to tell you what are the steps and rewards that are waiting for you in the Allegiance quest. To begin the Allegiance quest, you simply have to meet The Drifter. During his talk with him, he will give you a choice to either side with him or select The Vanguard. You’ll get the information of the quests and rewards that lies ahead for this quest as both characters will give unique missions with distinct rewards. The Drifter will not forget this choice and it will affect your performance to unlock a specific lore book. After you make your choice, you’ll be able to see the quest in “Pursuits tab”. Each quest will require multiple steps to complete. If you take The Drifter’s side, your reward will be: one piece of Gambit gear and one of each types of Gambit Prime Synths. Although, if you prefer Vanguard, the reward at the end of the quest will contain one piece of Vanguard gear, one Enhancement Core and Boon of the Vanguard consumables. You’ll receive the same reward each week from either The Drifter of The Vanguard. Don’t forget that these rewards are extremely useful and they can help you rank up in the game. There is down side to if you pick The Drifter. You won’t be able to complete lore book called “The Warlock Aunor”. There is a way to enjoy both quests and that is by allying different characters to each of them (Drifter and Vanguard). Who would be your first preference from The Drifter and The vanguard? Do tell us the comments section below.